Tue, Mar 20, 2018, 12:02 pm SL Time, ColomboPage News Desk, Sri Lanka. 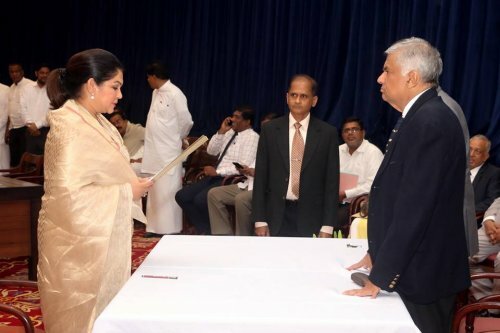 Mar 20, Colombo: The first female Mayor of the Colombo Municipal Council (CMC) Rosy Senanayake and 60 other councilors elected from the United National Party (UNP) took oaths before the party leader and Prime Minister Ranil Wickremesinghe at Temple Trees yesterday (19). Mohammed Iqbal took oaths as the Deputy Mayor. Minister D.M Swaminathan and several other UNP Ministers and Parliamentarians were also present at the ceremony. 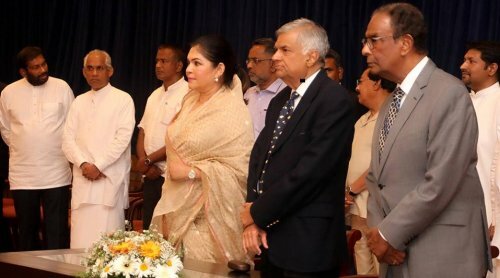 Addressing the newly elected UNP members to the CMC, Prime Minister Wickremesinghe said it is their duty to find the funds and effectively address the issues faced by the people in the city such as the spread of dengue and waste disposal.